The text of my presentation at the Mirandanet / IFIP / IBO / ITTE policy thinktank on ‘Towards tomorrow’s successful digital citizens’, at London Knowledge Lab, 24 February 2015. I’d like to spend my five minutes or so doing some mountain climbing with you. David McCandless does some beautiful information visualisations – I’d highly recommend his ‘Information is Beautiful’ for your coffee tables. 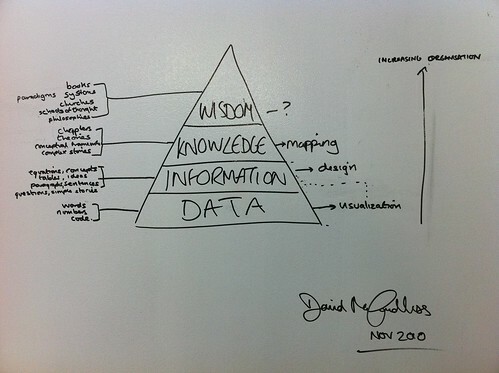 This is by him, and it nicely sums up something of the relationship between data, information, knowledge and wisdom. It’s tempting to equate this with the three-fold view of computing that we have in the new computing curriculum thanks, in part at least, to the Royal Society report, linking computer science with the foundational data, recognising the applications of IT in the information and knowledge layers and, on a good day, hoping that a more inclusive definition of ‘digital literacy’ might encompass at least some elements of wisdom. As Ben Goldacre would have it: I think you’ll find it’s a bit more complicated than that. The definitions of and boundaries between CS, IT and DL are by no means universally agreed or fixed, although I do think foundations / applications / implications model is a helpful one for curriculum design and development. More importantly than mere semantics though, there’s a sense in which ‘computational thinking’, our new buzz phrase, gives insights into the big picture here: recognising in part that information represents the patterns in the data, and knowledge is, again in part, a generalisation of information. For Jeanette Wing, oft credited with coining the term computational thinking (although it goes back to Papert…), abstraction lies at the heart of computational thinking, and abstraction is about managing complexity – as we climb the mountain here, we engage in abstraction, setting to one side the detail of the data in information, and the detail of information in knowledge. Lets start at the bottom. For my generation, the vast quantities of data generated, stored and analysed by modern computers seem almost unimaginable. Kryder’s ‘law’, a corollary of the more famous Moore’s law, observes that storage capacity doubles every couple of years or so: perhaps even more quickly on a global scale. It’s possible that the amount of data we, as a species, have stored since February 2013 matches the amount stored in the whole of human history up until then. Admittedly much of this is videos of cats playing the piano, but there you go. Do those of my daughter’s generation, who’ll not remember a time when they couldn’t work an iPad or watch UTube, take this for granted? Perhaps. But that doesn’t mean alleged ‘digital natives’ understand this – our new curriculum seeks to provide at least some insights into this, with explicit requirements that pupils be taught about uses of IT beyond school, to collect, analyse, evaluate and present data as well as information, and to understand how data of various types can be represented and manipulated digitally. For good or ill, pupils’ algorithms and code are, almost of necessity, at the level of data, although I live in hope that this programming will help them along the road to think about thinking and learn about learning, just as Papert saw with pupils programming in Logo back in 1980. Passing on information is what human beings do. From one, fairly reductionist, perspective, life is a mechanism for passing on the information in genetic code. Language (probably) sets us apart as a species, allowing us to learn from the experience of others as they describe that, and we remember that, through language. Writing allowed this passing on of information to transcend the limits of time and space. Printing, books, libraries, made information available to the many rather than the few: if you could read and had access to books, you could learn (almost) anything. The telegraph, telephone, radio, TV and internet speed up the process of passing information on over distances. Berners-Lee’s genius in finding the killer app for the internet, the web, isn’t just about instant access to civilisation’s biggest library: it’s the democratisation of publishing and broadcasting that this makes possible: the primary school child can share information with an audience of close on three billion others – that is incredibly empowering of course, but just because they can, doesn’t mean that they should. Coping with this previously unimaginable quantity, diversity and richness of information is not, I think, an innate skill: it’s something that needs to be learnt, and call me a traditionalist if you will, but I think this means it needs to be taught. The machines help, of course: imagine navigating the web without Google (other search engines are, apparently, available), but this too carries risks. I believe Google when they assure me they’re not evil, but never since the reformation has one organisation determined so many people’s access to information. Which brings us to knowledge. Think of knowledge as the emergent property, the network effect, of information – as less about collecting information and more about connecting information. This is the genius of the web – the links between the pages, not the pages themselves. This is how Google works – its success is less about the information in its cached, indexed copy of the web, as the way it leverages the links between web-pages to rank them by relevance. This was, and remains, the job of the school: not so much to pass on information from one generation to the next, but to help pupils acquire knowledge by connecting new information, new ideas, with what they know already. In our ‘information age’, teachers play a role in curating content – in drawing their pupils’ attention to the most relevant, the most useful, the most interesting things they don’t know, and helping them to make sense of this by connecting this to what they do know. Access to books, the web, to Google is great, really it is, but it’s only those who are interested, who are motivated, who’ll put in the energy to reduce the entropy, to bring order and structure to the chaos of random results. With young children, we help; for older children, surely we should be teaching these skills and attitudes, so pupils can do this themselves – I suspect many of us working with first year undergraduates wish schools, and exam boards, had spent a little longer on this. ‘An introduction to the essential knowledge they need to be educated citizens. It introduces pupils to the best that has been thought and said’. Think for a moment on what those opportunities, responsibilities and experiences may be for children entering school this September. There’s a recognition here of a moral purpose to education – that being a citizen in an ever more digital world encompasses more than the acquisition of mere knowledge, that it also demands an understanding of what the right thing to do is, and the moral courage to do that. Of knowing not only where to go for to find things out, but also to know how best to put that knowledge to use. Of, yes, making the most of the near ubiquitous connection to others and to near infinite content, but also of knowing that we have strictly finite attention, and that turning off our machines and their connections, and attending to those in the room, may, often, be the wisest thing to do.